Is it a uniquely Irish trait, or do other nationalities slag off their friends too? I had a great night out with the Raharney women at the weekend and most of the night was spent recounting ﻿incidents that had happened to us over the years. I realised that the majority of them were a result of being at the brunt of each others' well meant, if sometimes caustic, sense of humour. Many moons ago I was driving the others home from a night out. I mustn't have been driving for long because I remember my car was a yellow Ford Fiesta. Those were the days before I named my cars! Out of nowhere, a kamikaze rabbit jumped out in front of me, got dazzled by the headlights and froze. Crunch, crunch. Front and back wheels went over it. "Oh God. Do you think its dead? I'd hate to think of it lying there in pain, dying slowly." "Of course it's dead", replied Lorna. " The weight of us in the car going over it would have killed a horse! It's well out of its misery." "It's the twenty little bunnies waiting patiently in their burrow for their Mummy to return that I feel sorry for. They'll probably all starve to death now." 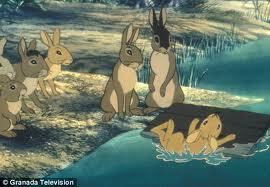 And the car's occupants all burst simultaneously into the chorus of Bright Eyes from Watership Down!. And we're still friends after all those years.